Book Review Western Landscapes. By Lee Friedlander Reviewed by Blake Andrews Yale has published a slew of Friedlander books since acquiring his archive in 2010, and they've all been hefty. Yet they're dwarfed by the scale of Western Landscapes. Like the West itself, this tome is grand, 14 x 12 inches in size, chock full with 189 full page photographs. Western Landscapes. By Lee Friedlander. Yale University Art Gallery, 2016. Photographs by Lee Friedlander. Text by Richard Benson. Yale University Art Gallery, New Haven, USA, 2016. 200 pp., 189 tri-tone illustrations, 13½x15". Looking through a book of Lee Friedlander photos is like watching a magician perform coin tricks right in front of you, but with a camera. His hands are plain to see. His motivations are clear. You know he's going to trick you, and you're prepared to catch him in the act. But when the photo comes it still comes as a surprise. How did he do that? Then you turn the page and the next photo does the same thing. The effect is a mix of bewilderment, delight, and envy. Friedlander has applied his slight of hand to virtually all subjects. He's photographed streets, social landscapes, car interiors, jazz musicians, and family, not to mention Aunt Mary’s laundry and Beau Jack, the dog, peeing on a fence, and a row of potted tuberous begonias on the porch and seventy-eight trees and a million pebbles in the driveway. Whatever's in front of his camera will do, but throughout his career, he's had a particular affinity for natural landscapes. He's now 82, he's been shooting landscapes for the better part of six decades, and he's damned good at it. His inimitable style employs a monochrome palette for heightened formal ambiguity. When combined with a wide depth of field, a magpie's layering instinct, and an acute sensitivity to place, the effect is his own brand of pleasing visual chaos. Landscapes are where Friedlander's style truly comes into its own. For these are the images, unconcerned with social context, documentation, or ulterior motive, which allow him to focus on the simple act of picture-making by and for itself. Western Landscapes. By Lee Friedlander. Yale University Art Gallery, 2016. Which brings us to Western Landscapes, the latest — and, in my opinion, best — in a recent flurry of Friedlander books from Yale Press. The book is published in conjunction with a Fall exhibition at Fraenkel Gallery in San Francisco, selected from landscapes made over roughly the past two decades. All were shot with Super-Wide Hasselblad, most with fill-flash, and most on road trips with photo buddies Richard Benson, John Childs, and the late John Szarkowski. This quartet — captured in the book posing below a stuffed bison — made an annual ritual of western photo outings, often to National Parks, and by the look of the photographs often in Winter/Spring. Yale has published a slew of Friedlander books since acquiring his archive in 2010, and they've all been hefty. Yet they're dwarfed by the scale of Western Landscapes. Like the West itself, this tome is grand, 14 x 12 inches in size, chock full with 189 full page photographs. The book's spine audibly cracks under its own weight when opened wide. After a brief quote from A.B. Guthrie, Jr., Western Landscapes wastes little time getting down to business. The photographs begin, and then continue in dual spreads with no letup for the next 188 pages. The effect is a bombardment, and most readers will want to come up for air with a few breaks. The pace would probably be easier to digest if the material itself were not so dense. Friedlander's inside-out style places his camera into deep cover, and then attempts to view the world through vegetative congestion. In the words of Fraenkel, he uses "unconventional vantage points". That's putting it mildly. From these cramped perspectives, the frame tends to capture a sloppy mess, but there's method in the madness. A close study of the photos reveals just how carefully his positions are chosen. Branches, skylines, leaves, and rock jigsaw are so perfectly together that they might be drawn. That's the coin trick. Friedlander's magician approach sets traditional landscape photography on its head. For the latter part of the 20th century, the tradition was to depict nature in a straight, clear manner which put the emphasis on the subject. If done well, ideally the subject might transcend to magnificence. Think of Weston's nautilus or Adams' monolith. Even supposed counter movements like the late 1970s New Topographics retained an essentially unchanged idea of photography as objective translation. The subjects were reconsidered but their method of depiction remained essentially unchanged. But Friedlander! His photographs are less about the landscape than the very act of seeing. Each photograph in Western Landscapes is an individual exercise in how to put a picture together. A bit of twig, a stream, a clutch of shrub…pack them into the ground glass and voila! In this context specific landmarks seem incidental, as the photo itself takes precedence. Richard Benson describes this effect well in the book's afterward: "Friedlander's pictures draw the viewer into idiosyncratic qualities of the terrain while skewing expectations of beatific grandeur." Benson continues: "What is radical here, and deeply modern, is that the synthetic nature of the picture is unmistakable —we never doubt that these are pictures we are seeing and not the world that made them. Yet —at the same time— photographic description is so strong that we being to accept that this new view might actually be what it looks like out there." Look through an entire book of such photographs and the synthetic/real dynamic takes on cumulative impact. You're back at the magician's table watching sleight of hand. You know what's coming. But when it comes… Gotcha! 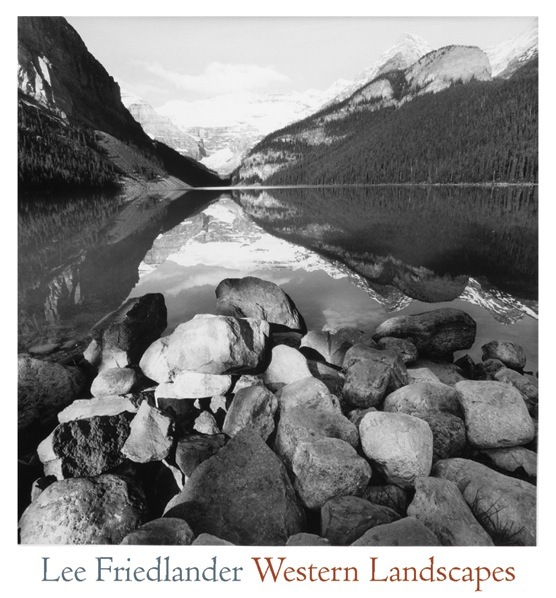 Western Landscapes is exactly the sort of book one would expect from Friedlander. Yet somehow each photograph still comes as a surprise.